I have to say that I am very disappointed by this news. When I reported on the bankruptcy filing by the company two months ago, I was really hoping that Circuit City would go the way K-mart did — shortly after filing bankruptcy a few years ago, K-mart announced that they were acquiring Sears — and bounce back. Unfortunately, it just didn’t happen that way. The good news is, if you jump on the sales, you can probably get some great deals on electronics over the next few weeks. 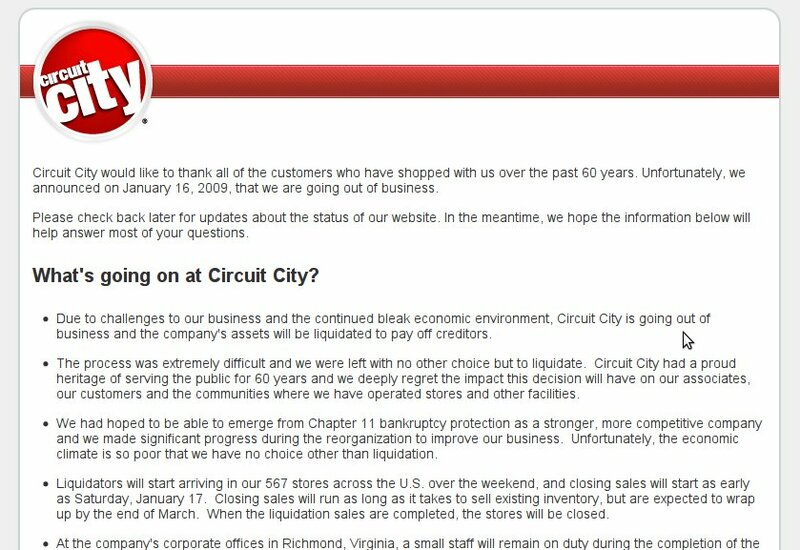 The bad news is, Circuit City will be gone forever. While a lot of people support Best Buy more than they support Circuit City (obviously, since Best Buy is still in business and Circuit City is going the way of the do-do), I was one of the few that liked Circuit City much better. I am saddened to see them go. Even more depressing for me is the fact that the closest Best Buy is over an hour away, while Circuit City was less than 15 minutes from my house. In a somewhat serendipitous situation, though, I checked Circuit City’s Web site last night and found that the television we purchased a few weeks ago was on sale for $50 less than we paid. So, I printed the page with the price, grabbed my receipt for the television and brought it with me to work today. On my way home, I stopped at Circuit City to get my $50 back. Had I not done that, I wouldn’t have been able to get my money back, as it appears from the message on the Web site, that they will no longer honor the price guarantee as of tomorrow. Good job on getting the $50 back! While so many in the blogosphere bash CC – and while I don’t think they were that great – think of the 35,000 people now unemployed.